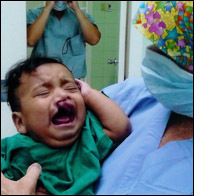 I would like to take this opportunity to express my sincerest gratitude for The Benjamin H. Josephson, MD Fund�s support for my participation in Ecuadent�s July 2011 Medical Mission to Esmeraldas, Ecuador. Thanks to your generosity our Ecuadent team was able to provide 25 patients with the life-changing surgeries they so desperately wanted and needed. Our medical mission�s work took place at the Naval Hospital in Esmeraldas. The team included a plastic surgeon, his assistant and resident, an anesthesiologist, two operating room (OR) registered nurses, and two registered nurses for the post anesthesia care unit (PACU). As an OR nurse, I performed both scrub and circulating roles. We arrived on Friday, July 22, and toured the hospital. Early Saturday morning the four nurses set up the OR and PACU, while the surgeon and his team performed triage on potential patients. We began operating on Sunday morning and over the next four days performed 25 surgeries: eight palates, six cleft lip, three burn contractures, four polydactyl/syndactyl corrections, and a combined four lipoma, otoplasty, and ear tag. All patients tolerated the surgeries well. By the time of our departure on Friday, all patients had returned home or were preparing to do so. Enclosed are before and after photographs of two patients. Again, thank you for your support for my travel expenses without which I would have been unable to contribute to this successful and important mission.